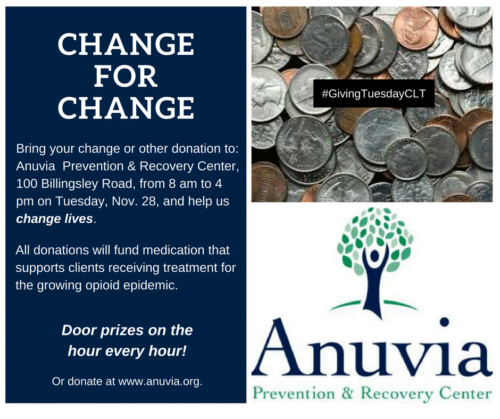 Anuvia, in partnership with SHARE Charlotte, is participating in #GivingTuesdayCLT, which is Tuesday, Nov. 28, this year for the first time ever. In an event called ‘Change for Change’, supporters are being asked to drop off the change from their change jars or other monetary donations at Anuvia, 100 Billingsley Road, from 8 am to 4 pm on Tuesday, November 28. Everyone who stops by and drops off their change or other donation will be entered into a raffle for hourly drawings for fun door prizes such as Starbucks gift cards and t-shirts. Anyone who can’t make it to Anuvia is being asked to make a donation here. However, medication-assisted treatment is expensive, which is why Anuvia has started to ask supporters for donations specifically to fund this initiative. If you have questions about this campaign, give us a call at 704.376.7447.